Welcome to Flawed yet Functional and to my dairy-free, egg-free, and gluten-free kitchen! When I have company over, sometimes I keep things plain and simple. For a play-date, my friends usually pack their own lunch so each mom only has to prepare for her kids. Easy-peasy! However, other times I like to pull out all the stops. I like to serve a nutritious, delicious meal to not only feed my friends but show them the delicious variety vegetables offer. 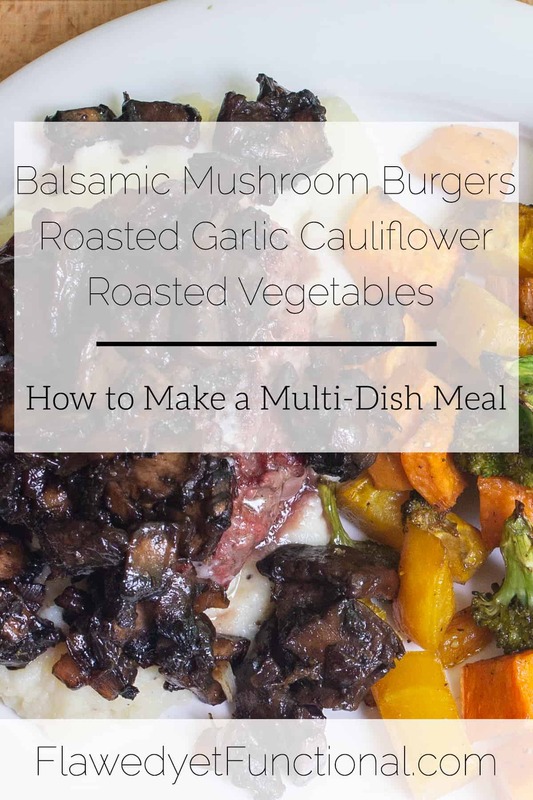 Today, I’d like to share Balsamic Mushroom Burgers on Cauliflower Mash with Roasted Vegetables along with tips on how to make a multi-dish meal successfully. 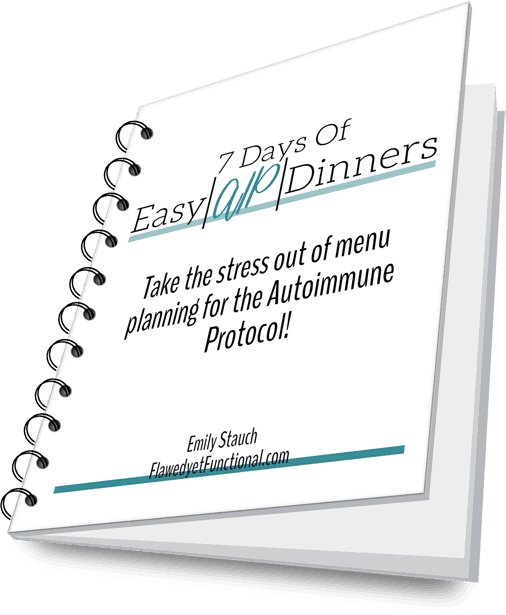 Usually, I only show you a recipe for one dish at a time, but I thought it might be helpful to show how I prepare a multi-dish dinner along with the recipes for each part. Just like cooking is a learned skill, hosting and preparing food to be ready at the same time is a learned skill too. It takes practice, but you can do it! Each part of this company-worthy meal is simple, they just use basic grilling, sauteing, and roasting techniques. However, there are 4 separate dishes to make which can be a lot for one person. I recommend asking your spouse help: one person man the grill while the other prepares the rest of the vegetables inside. Before cook anything, I think through each dish and how long it takes to cook. For the grill, I include warm-up time so I can tell Dan when to start so all he has to do is start the grill and cook the meat which should end up ready at the same time as the rest of the meal. Now I mentally think which dish needs to be cooked first and make a list (a physical list only in the case of Thanksgiving dinner, but it might help you to actually write it out if you are new to this!). Counter | Complete all mise en place. Chop all the vegetables, onions, and garlic. Oven | When garlic is finished, increase temp on oven and put in vegetables to roast. Grill | Dan should be bringing the finished hamburgers in now! Don’t forget to think through with kitchen surface it will be using. You don’t want to have two dishes that need the oven at the same time, and also you don’t want to have 4 pans that need to cook at the same time on the stove-top (yes, there are 4 burners, but I don’t have any pans small enough to actually fit 4 on the stove-top simultaneously). For my kitchen, I like 1 item in the oven with 2 max on the stove-top. It’s an intense bit of kitchen work, but this meal should come together in less than 90 minutes including prep time. For a complete Paleo/AIP meal with 5 vegetables in it, that’s not too bad! On each plate, smear a large spoonful of the roasted garlic cauliflower mash and place the hamburger on the mash. 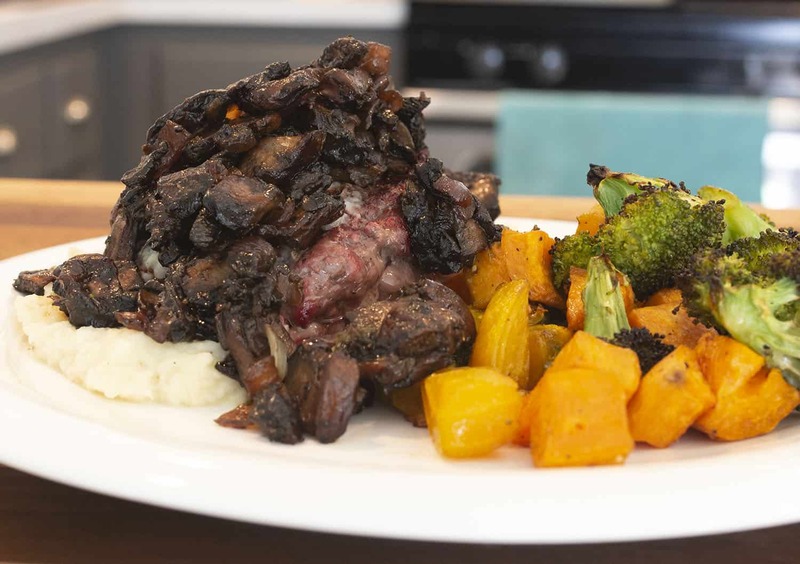 Top the hamburger with balsamic mushrooms and place a serving of the roasted vegetables on the side. Not only with the food taste delicious, but it will look like you are eating at a fancy restaurant. There’s just something about a beautifully plated meal! The perfect savory topping for hamburgers or steak! This savory mushrooms are Paleo and AIP-friendly and will jazz up any meal. Chop the mushrooms into small pieces, whatever size you like to eat. They will shrink when cooked. Chop the onion fine. Heat a medium skillet over medium-low heat and add 1 tablespoon of olive oil. When oil is shimmering, add the onions and cook, stirring occasionally, until the onions begin to sweat and release some moisture. Add the mushroom to the onions and sprinkle with salt and pepper. Cook until soft and very brown, stirring occasional, about 10 minutes. Pour vinegar in the pan and scrape any browned bits off the bottom of the pan. Turn off the heat and taste for seasoning. Add salt, pepper, or more vinegar as needed. Not eating gluten or grains? No worries! Use this AIP/Paleo mashed cauliflower as a delicious base for your hamburgers, pork chops, meatloaf, steak, etc.! Keeping the garlic bulb whole, cut off the top 1/4" or so to expose the garlic cloves. Place in the middle of a sheet of aluminum foil, 10"x10", and drizzle olive oil over the cut end of the bulb. Wrap the foil up around the bulb, pinching it closed at the top. Bake for about 30 minutes or until garlic is soft, brown, and fragrant. While the garlic is baking, bring water to a boil in a dutch oven (enough to cover the cauliflower, about 3-4 quarts). Cut off the stem and any green leaves from the base of the cauliflower. Cut the head in half then cut each half into four pieces. When the water is boiling, add the cauliflower pieces and cook until soft, about 10 minutes. In a blender or food processor, add 1 tablespoon of olive oil, salt, pepper, whole bulb of garlic (garlic removed from paper), and soft cauliflower. Blend until smooth. Taste and add more salt and pepper as needed. Everybody should know how to make a good hamburger! Salt, pepper and heat are all you need to make a great hamburger! Pre-heat grill to 600° or there about. A good burger needs HEAT. While grill is heating, break hamburger into small pieces then portion into 6 burgers, 1/3lb. each. Handle the burger gently. Do not press firmly together. Just push until the patty holds together and no more. A loose pack will allow for a more juicy burger. Sprinkle both sides of the burger generously with salt and pepper. Place on a plate in the fridge until the grill is ready. When the grill is hot, place burgers on grill and shut lid. Cook for 3 minutes. Flip burgers then cook, covered for 2 more minutes. Check the temperature of the meat with an instant read themometer, pull off at 125°. The meat will continue to cook as it rests on the plate. It will rise to 135° to be medium rare when you eat it. If you'd like your burger more done, continue cooking but test temperature every 30-45 seconds. It will cook fast. Pull the burger off the grill 10° before your desired doneness (so for well-done, pull at 145°. Roasted vegetables are so easy and versatile. Consider this recipe a basic recipe and adjust to whatever vegetables you have access to. Peel and chop all the vegetables and place into a large mixing bowl. Drizzle with olive oil, salt, and pepper. Continue to add olive oil until all the vegetables look coated and shiny but oil is not pooling at the bottom of the bowl. Pour onto baking sheet and arrange in a single layer (use two pans if necessary). Roast for 20 minutes, stir then continue cooking for 15 minutes or until all vegetables are soft.